This is the first of an irregular series of questions we will ask people as the fancy takes us. First with the answers is, um me, Simeon Beresford. What was the last book you read and who was it by? There are so many but A Bear called Paddington is hard to beat. What book do you absolutely hate but were forced to read? The Lord of the Flies – I could not face it already knowing how it would end badly. I keep all my books I do not collect them, which to my mind means I look after them. I use libraries on occasion, but right now second hand from Amazon is my acquisition mode of choice. 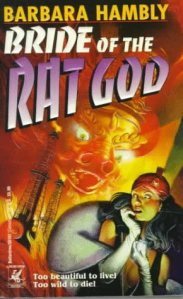 I hear that the ebook rights to the long out-of-print Bride of the Rat God by Barbara Hambly have just been acquired. Grab it when it appears!